The rosy economic narrative that the Trump administration often touts glosses over women’s diverse experiences—and a closer look at economic data suggests that this narrative is dangerously deceptive. Since 2000, for example, women’s wages have grown more slowly than men’s wages, and women overall have been less likely to participate in the labor force. The labor force participation of some women, particularly women of color, is irregular or has stagnated. Persistent racial and ethnic disparities in wages only compound challenges for many women of color, who disproportionately work in low-wage jobs. These trends make it difficult for women, especially those working in low-wage jobs, to keep up with the United States’ soaring costs of living. This means that women must work more, while making less and struggling to get ahead. In other words, women workers today are treading water. Every day, women confront the challenges of managing work, family, and the costs of raising children and caring for and supporting loved ones, often with little external support. While these work-family challenges are nothing new, too many workplaces, government policies, and economic strategies have not evolved to respond effectively to families’ changing realities. The Trump administration, meanwhile, has prioritized the needs of the rich and corporations, passing tax cuts for the wealthiest Americans while blocking overtime pay, failing to raise the minimum wage, stalling equal pay measures, and proposing inadequate and harmful work-family policies. Within the workplace itself, women continue to grapple with long-standing inequities, including a stubborn gender wage gap that stems from a lack of supportive work-family policies, biases ingrained in workplace culture, discrimination, and occupational segregation that reflects women’s overconcentration in low-wage jobs. The unique experiences of women of color—who live at the intersection of compounding gender, race, and ethnic biases—are often ignored entirely, meaning that the practices and attitudes that devalue their skills and limit their opportunities for advancement frequently go unchallenged. Yet while many workplaces fail to invest in their workers, and often fall short of what women need and deserve, some are evolving. Companies are adapting to the “future of work,” for example, by increasing automation and evolving technologies. Yet the rise in insecure work arrangements—including domestic outsourcing, independent contracting, and app-based technology platforms, combined with the erosion of unions and workers’ power, has shifted work expectations away from one 9-to-5 job to multiple, often unsteady jobs. This results in blurring the lines between work and personal time. Coupled with the evolution in economic and employment opportunities, these shifts have pushed women into a mode of constant recalibration, job juggling, and caregiving coordination to make it all work. This column reviews how women’s work is segmented and undervalued; how workers at the margins—such as domestic workers, farm laborers, part-time workers, and gig economy workers—face persistent barriers and inequality; and how policymakers must prioritize centering workers’ voices and holistic needs and experiences as they craft meaningful economic policy. While this column does not detail the myriad ways in which women often struggle to maintain their economic security to the detriment of their health, it is important to emphasize that women do not live their lives in silos, and access to a range of programs and policies, such as comprehensive reproductive health services, as well as access to affordable education and skills-based learning, are critical to women’s economic success. In December 2018, 58.8 percent of adult women ages 20 and older participated in the U.S. labor force, with 73.8 million adult women employed. Women’s current unemployment rate of 3.8 percent is the same as it was in 2000. However, women’s overall labor force participation has actually decreased since 2000 due to smaller shares of women entering the workforce each year. Women of color have experienced different trends; black women, for example, have high labor force participation rates but lower wages, as well as high unemployment rates. Understanding women’s work requires looking at more than just one indicator for women overall—it also means studying the differences among women of color and acknowledging the challenges that women still face in the workplace. Almost 4.1 million employed women work multiple jobs, often in order to make ends meet. Women make up a key part of the economy and provide vital economic support for their families: More than 64 percent of mothers are primary or co-breadwinners in their families. Despite the continued growth of the U.S. economy, however, workers’ wages are still stagnant. This means that women in the labor force often continue to work hard without a commensurate increase in real wages, exacerbating persistent income inequality and threatening the livelihoods of low- and middle-income women and their families. The gender wage gap also puts women at a disadvantage. In 2017, the median earnings for women working full-time, year-round was only $41,977, or 80.5 percent of men’s earnings. And the gap is worse for almost all women of color in the United States—particularly Hispanic, black, and Native American women, who experience racial, ethnic, and gender discrimination in the workplace. Women living in rural areas and women with disabilities also face large, persistent wage gaps when compared with men. Occupational segregation—or the separation of women and people of color into lower-paying jobs and industries due to structural barriers—plays a role in the wage gap, especially as women are concentrated in jobs that pay minimum wages or tipped minimum wages. While unions boost pay for women by 13 percent compared with nonunion women, conservative attacks and a changing economy mean that only 9.9 percent of women are currently represented by a union. Another challenge of lower-paying jobs is the lack of benefits and predictable schedules, two things that can be essential for women with children and caregiving responsibilities. In addition, many working women often “come home to a second shift of unpaid” household labor and caregiving that is undervalued. The lack of quality and affordable child care in the United States, as well as limited child care access for families in rural areas, also creates burdens for working mothers. In short, women’s work continues to be undervalued and underpaid. This is especially the case in female-dominated occupations—such as child care providers, receptionists, home care workers, maids, and housekeeping cleaners—and in low-wage jobs, which employ a disproportionate number of women. Although women make up the majority of teachers in public schools, for example, they earn less than their male counterparts. And as more women enter occupations once dominated by men, the wages decline, undervaluing the work women perform. The barriers women face in the labor market and the challenges associated with managing work and family responsibilities mean that women often perform paid work that is nonstandard or undervalued—working at the margins of the economy to make ends meet. This has historically been the case for women—especially women of color, who were expected to work outside the home at a time when middle- to high-income white women were not and who were segregated into low-skilled and low-wage occupations such as domestic servants, seamstresses, laundry workers, and farm laborers. Their exclusion was further codified in 1938, when domestic workers and farmworkers were excluded from legal protections, including minimum wage requirements, in the Fair Labor Standards Act. Women still make up 95 percent of domestic workers, and a majority of them are women of color and foreign-born and non-U.S. citizens. These women are often mistreated due to the intimacy of their jobs and the lack of regulations and workplace protections. Farmworkers also work in a dangerous and unregulated industry for meager wages; 80 percent of U.S. farmworkers are Hispanic, and more than 1 in 4 are women. Many women also work in part-time or flexible jobs to manage their work and family responsibilities. Almost 1 in 4 employed women worked part time in 2017, twice the number of men employed part time. Millions of women working part time do so because of child care or family obligations that can involuntarily force them away from full-time work. Part-time and low-wage jobs often have lower benefits, as well as a lack of workplace protections and poor working conditions, both of which contribute to women’s increased vulnerability to sexual harassment and abuse in those occupations. Workers are turning to freelance work in the gig economy to take advantage of its greater independence and flexibility, things that can help them manage their family and caregiving responsibilities. But the rise in this nonstandard work has perpetuated inequalities in the workplace, especially for women. Gig economy workers are frequently classified as independent contractors rather than employees, meaning that they are excluded from legal protections and benefits designed for employees, such as minimum wage and overtime protections, unemployment protections, sick time, retirement benefits, and protections from workplace injury and discrimination and harassment. The lack of these protections leaves gig workers at greater risk of misclassification, low wages, exploitation, and harassment—something policymakers have been slow to respond to and prevent. To address the challenges that women face both at work and at home—especially women in low-wage and nonstandard work, including many women of color—policymakers must work toward a new social contract that includes four key components. First, workers should be assured fair and equal wages, with an increase in the minimum wage, elimination of the tipped minimum wage, stronger equal pay protections, and robust overtime and wage theft protections. Second, workers should be assured high-quality jobs with essential workplace protections and benefits, including access to earned sick days, fair scheduling, broad health and safety laws, and protections against discrimination and harassment. Third, workers, especially women, need policies that accommodate and support their caregiving responsibilities, such as inclusive paid family and medical leave and quality and affordable child care. Fourth, policymakers should listen to and prioritize workers’ voices when creating new policies to ensure that they address the holistic needs of all workers. This should include partnering with unions and ensuring that workers are able to form unions and bargain collectively under labor law. Some examples of innovative state policies and proposals already exist. The Domestic Workers Bill of Rights has passed in eight states and one city and provides domestic workers with protections such as a minimum wage, job protection, sick days, rest time, and access to health care. A National Domestic Workers Bill of Rights will soon be introduced in Congress by Sen. Kamala Harris (D-CA) and Rep. Pramila Jayapal (D-WA) to expand protections for domestic workers across the country. Eleven states increased their minimum wage in 2019, providing vital support to their lowest-wage workers. In 2018, six states passed pay equity legislation, allowing workers to discuss their salaries or banning the use of salary history in hiring. New York and California have also successfully raised wages in certain industries through wage boards that bring together employers, workers, and the public to negotiate better industry wages and benefits. Portable benefit systems are also a promising solution to provide workers with paid family and medical leave, health insurance, retirement plans, and workers’ compensation. These benefits exist outside traditional employer allocation systems, meaning that workers would be able to access them when moving between jobs or if they have multiple jobs. State paid family and medical leave programs are one model of a portable benefit system with proven success, in which workers contribute to a social insurance system through a payroll tax and can then access paid leave to care for a new child or their own or a family member’s health. Six states and Washington, D.C., have passed paid family and medical leave laws, helping improve the economic security and health of workers and their families. And Washington state is debating legislation that would require app-based technology platform companies to raise standards for gig economy workers by contributing to worker-administered benefits funds. The Trump administration’s boasting about the U.S. economy fails to recognize the complexities of women’s daily lives and their diverse experiences in the workplace. It is time for policymakers to acknowledge and address the challenges that women face in the workplace and in managing their caregiving responsibilities without supportive work-family policies. 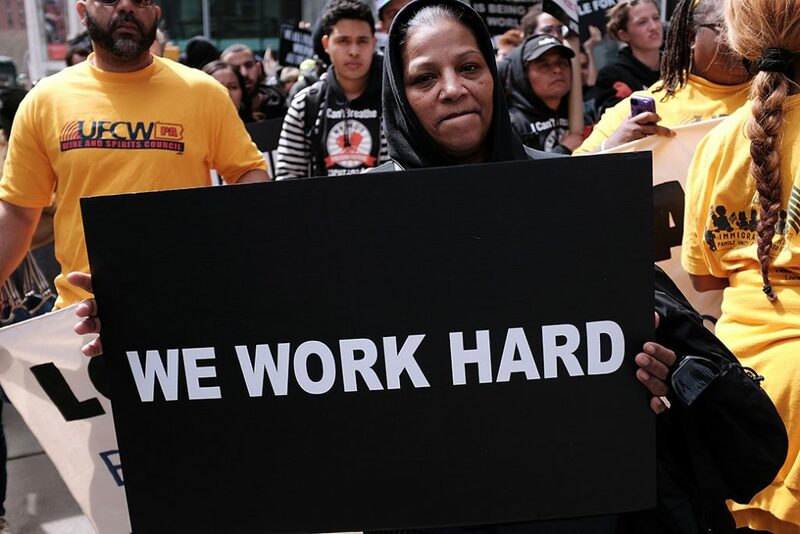 By understanding the disparities faced by the nation’s most vulnerable workers, particularly women of color, policymakers can begin to tailor policy solutions to meet workers’ current and future needs. Doing so will only grow in importance as the nature of work changes and workers no longer have access to traditional employer-provided benefits and workplace protections. Policymakers must prioritize new and essential workplace standards that reimagine labor laws and workplace protections and benefits in order to ensure the economic security of all workers, particularly women. When developing and touting economic policy proposals, policymakers must seek a real-world understanding of all women’s lives—including their everyday experiences and the challenges they face. Shilpa Phadke is the vice president of the Women’s Initiative at the Center for American Progress. Diana Boesch is a research assistant of Women’s Economic Security for the Women’s Initiative. The authors would like to thank Katherine Gallagher Robbins, Karla Walter, Lily Roberts, and Jocelyn Frye from the Center for American Progress for reviewing this column and providing invaluable edits and suggestions.